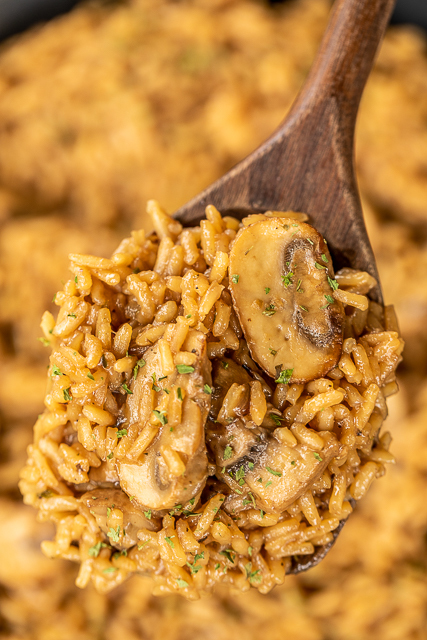 This Au Jus Mushroom Rice was a huge hit in our house! 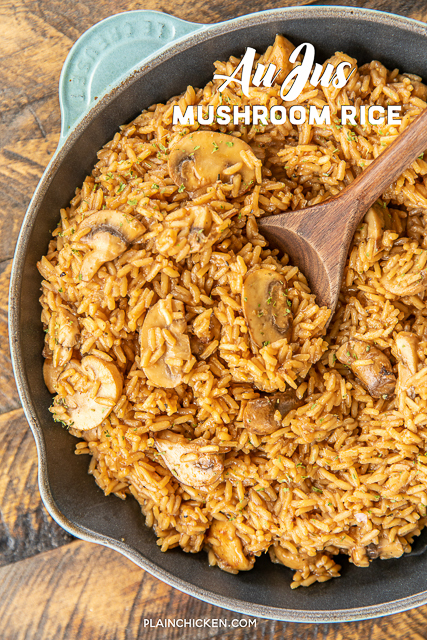 Chicken Legs is a HUGE mushroom fan, so he ate two big helpings of this easy rice with dinner. Rice, beef broth, au jus gravy mix and mushrooms. YUM! 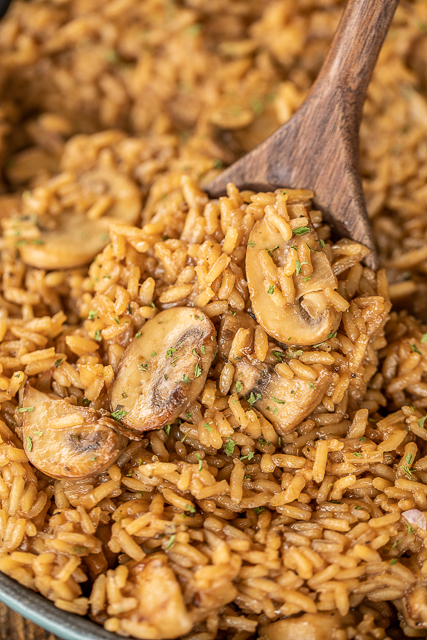 We served this Au Jus Mushroom Rice with some delicious grilled steaks. It was perfect. The rice takes about 20 to 25 minutes to cook and absorb the liquid. I usually start the rice when Chicken Legs starts prepping the grill and the steaks and rice are done about the same time. 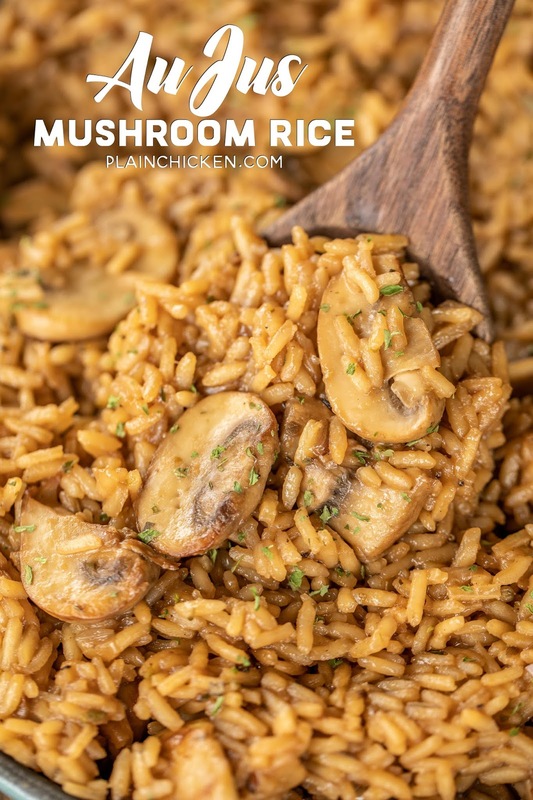 We eat this Au Jus Mushroom Rice as a side, but you could add some cooked ground beef or leftover pork tenderloin and make a meal out of this recipe. LOVE recipes that can do double duty! Melt butter in a large skillet over medium high heat. Add mushrooms and rice. Cook until rice is golden, about 5 minutes. Add remaining ingredients. Stir to combine. Bring to a boil. Reduce heat too low. Cover and cook for 20 minutes, until rice is tender and all the liquid is absorbed. Do you think this would work with cauliflower rice? How would you adapt to an Instant Pot.